Olympic 800m champion Caster Semenya's appeal against a regulation restricting testosterone levels in female runners began on Monday - as the head of world athletics again defended the rule. 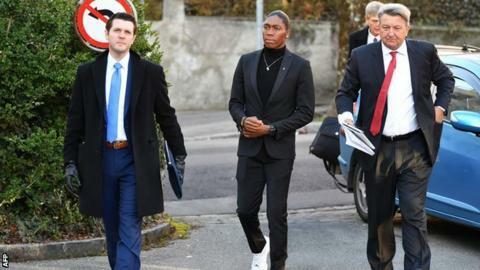 South African Semenya, 28, is seeking to overturn the regulation at the Court of Arbitration for Sport (Cas). But IAAF president Lord Coe said it would "protect the sanctity of fair and open competition". The case will be heard until Friday, with a verdict expected by 29 March. Why is Olympic champion in the news? The Inquiry: Is women's sport in trouble? "Semenya believes the IAAF press release is a clear breach of the confidentiality provisions that was orchestrated in an effort to influence public opinion in circumstances where the IAAF knew that Semenya would not be prepared to respond because she was complying with her confidentiality obligations," her lawyers said. "As a matter of fairness, Semenya raised this issue with the Cas and has been granted permission to publicly release information responding to the IAAF press release‚ including disclosing the experts who are testifying in support of Semenya's case." Athletics' governing body responded by saying it was within its rights to make the witness list public. "Cas left the decision for all parties to release their witness list to the parties involved," the IAAF said. "This was agreed." Under the IAAF rule, female athletes with naturally high testosterone levels would have to race against men or change events unless they took medication to reduce it. Athletes who wanted to compete in those events must take medication for six months, then maintain a lower testosterone level. It was intended the new rule would be brought in on 1 November last year, but the legal challenge from Semenya and ASA prompted that to be delayed until 26 March. Speaking in June, Semenya called the proposed rule "unfair", adding: "I just want to run naturally, the way I was born." As an 18-year-old, she was asked to take a gender test but no results have officially been made public. The IAAF denied a report on Thursday that lawyers would argue athletes like Semenya should be classified as male. This goes beyond Semenya's competitive future. There are lots of other sports governing bodies, including the International Olympic Committee, that are looking at this case because they are trying to determine what to do in their sports and events over this issue. Depending on which way it goes, it could have profound implications for the future of sport and women's sport. It goes to the heart of gender and identity at an elite level.